Add vibrant shimmer to your artwork with this 10-piece Assortment of Classic Neocolor I Metallic Pastels from Caran d'Ache. 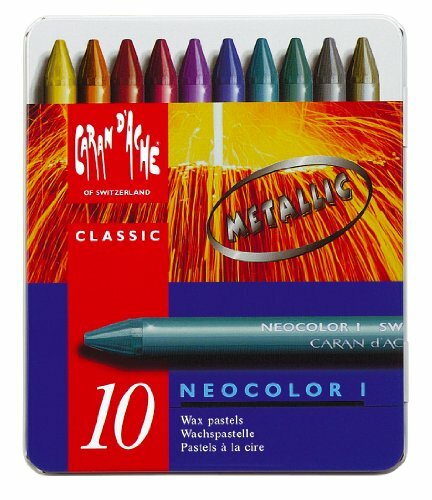 The reusable metal case comes with 10 vibrant, metallic artist grade pastels suitable for amateurs and professionals alike. This set includes Gold, Dark Gold, Bronze, Scarlet, Pink, Violet, Phthalo Blue, Phthalo Green, Silver and Ash Gray. These high quality artists' pastels meet the exacting standards of fine artists, illustrators, graphic artists and art teachers. Neocolor Pastels last twice as long as ordinary pastels or crayons, and can be used dry or with a wax-resist technique for art projects that include water colors. Neocolor pastels can be used on a wide variety of materials: paper, cardboard, glass, wood, leather, fabric, stone, etc. Water resistant pastels are soluble in spirits of turpentine. Set is packaged in a metal tin. Conforms to EM-71 (CE) and ASTM D4236 safety standards, suitable use in for U.S. schools. Neocolor wax pastels were introduced by Caran d'Ache more than 50 years ago. Today they are a legendary product for all artists, both amateur and professional. The quality of their pigments makes them irreplaceable. Caran d'Ache products are ideal for sketching, figure drawing, and portraits. Caran d'Ache uses high-quality pigments for colorfastness and excellent lightfastness. For over 80 years, Caran d'Ache has inspired amateur and professional artists, providing top quality pastels, pencils, paints, brushes and more.